Off Road Vehicle Use for operational purposes (e.g. grazing tenure holders or national park reserve operations for fence repair) as per the British Columbia Motor Vehicle Act and the Off-Road Vehicle Act. These activities will be managed within a conservation framework that emphasizes the maintenance of ecological integrity, visitor safety and quality visitor experiences. Are there other activities you would like included as an allowable activity in the proposed national park reserve? Recreational off-road vehicle use, as per the British Columbia Motor Vehicle Act and the Off-Road Vehicle Act. The federal government has no jurisdiction over property rights on privately-owned land adjacent to the boundaries of a national park reserve. Hunting is administered by the owner of those lands, subject to the British Columbia Wildlife Act. Parks Canada will work with owners of private lands who allow hunting in order to streamline activities. The transport of firearms is a federal law that applies in all of the provinces and territories in Canada (the Storage, Display, Transportation and Handling of Firearms by Individuals Regulations). The enabling Act for those Regulations is the Firearms Act. The law and act apply inside national parks and national park reserves. If you are transporting a firearm through a national park reserve to another destination it must be unloaded, disabled and securely encased as per federal law. See map outlining Provincial Wildlife Management Regions overlap with the proposed working boundary of the national park reserve. If you are the holder of a tenure in the proposed national park reserve area, the project manager will be in contact with you to discuss next steps and go over questions in greater detail. Indigenous relationships with the land and land use will be respected in the proposed national park reserve. The federal, provincial and Syilx/Okanagan governments agree that the South Okanagan – Similkameen offers potential for the establishment of a national park reserve. National parks and national park reserves represent the very best that Canada has to offer and tell stories of who we are, including the history, cultures, and contributions of Indigenous peoples. The proposed national park reserve would enable the inspiring South Okanagan – Similkameen landscape to be shared with local residents, British Columbians, Canadians and visitors from around the world. Parks Canada makes a substantial economic contribution to Canada’s economy. Through the spending of the organization and from the visitors, a significant and widespread economic impact is felt throughout the country and within local communities. Click here for more information. 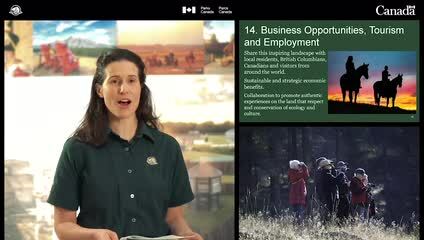 As planning progresses, Parks Canada will work with local chambers of commerce and tourism associations to collaborate on meaningful, genuine and authentic experiences on the land, which promote respect and teach the value of protecting and conserving all living things for the benefit of all, present and future.